Visiting The Lincoln Memorial The 19-foot statue of Abraham Lincoln welcomes millions of visitors to the National Mall in Washington, D.C., each year. Tourists from around the globe are drawn to it by the legend of Lincoln and the historic events that have occurred at the memorial's steps. More than 140 years after Abraham Lincoln's death, the marble structure erected to honor the 16th president easily draws millions of visitors each year. It's a simple structure with Doric columns and a statue of Lincoln that towers above the fuss at its feet. On the north interior wall, his second inaugural address is inscribed; on the south wall, the Gettysburg Address. Tourists spanning the globe from China to Chicago, Iraq to Atlanta, Norway to Seattle, point everything from cell phones to video cameras at the 19-foot figure hoping to capture a piece of history and bring it home. 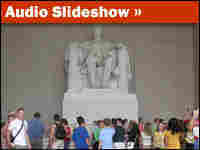 But why does the Lincoln Memorial compel so many people to pay their respects? On a recent day, NPR went to discover the answer.